And there it is! Amal's gorgeous Oscar de la Renta wedding gown for her big day. George Clooney and Amal Alamuddin arrive on September 29, 2014 at the palazzo Ca Farsetti in Venice, for a civil ceremony to officialise their wedding. Amal was wearing a picture-perfect Stella McCartney pantsuit for the ceremony. It's official! After their civil ceremony, this pair is husband and wife. The beautiful couple on their "Amore" taxiboat. Married couple George Clooney and Amal Alamuddin are seen outside Hotel Cipriani September 28, 2014 in Venice, Italy. A close-up shot of Amal's lovely wedding band - a skinny, classic diamond ring. The happy couple! George waves, showing off his classic wedding band. The "eternal bachelor" is no longer a bachelor! Crowds gather to see Hollywood's hunk and his beautiful bride. They really are a gorgeous couple, don't you think? Amal looked stunning in a long-sleeved white lace Giambattista Valli dress, embellished with pink floral motifs. The newlyweds couldn't stop smiling as they boarded a taxiboat in the Canal Grande. Their boat on the Canal Grande was fittingly named "Amore." A close-up photo showing both Amal and George's wedding bands, as well as more detail on her stunning Giambattista Valli dress. Hollywood heartthrob George Clooney and Lebanese-British lawyer Amal Alamuddin married in Venice on Saturday before partying the night away with their A-list friends in one of the most high-profile celebrity weddings in years. George arrives for his wedding -- looking impossibly dapper -- at Aman Hotel. A-List wedding guests Emily Blunt, John Krasinski, Matt Damon and Luciana Damon attend the ceremony dressed to the nines. Are those the ringbearers?! So cute. Cindy Crawford and husband Rande Gerber (rumored to be George's best man) prepare to board a taxi boat that will take them to George and Amal's nuptials. George laughs adorably as he stands on a taxi boat with father-in-law Ramzi Alamuddin on the Grand Canal on his way to the ceremony. George heads out on the town for his Bachelor party in Venice. Emily Blunt and John Krasinski are all dolled up the night before George and Amal's wedding festivities. George Clooney and Amal Alamuddin arrive in Venice on September 26, 2014. George and Amal, holding a bag bearing the logo A&G (Amal and George), arrive at Venice's Piazzale Roma on the eve of their wedding. Amal is wearing a gorgeous striped Dolce & Gabbana dress. The soon-to-be-married couple took a taxiboat upon their arrival in Venice, looking madly in love. Now THAT is a diamond! Amal Alamuddin's engagement ring. Clooney was wearing a classic grey suit and silver watch by OMEGA. George and Amal are all smiles in Venice. They met in Venice, and they'll seal their love in that same city this weekend -- also, please turn your eyes to that ROCK. George Clooney and new wife, Amal Alamuddin, couldn't be a more beautiful couple, and now they've got the People cover to prove it. The infamous bachelor married the British lawyer, in an intimate, star-studded ceremony in Venice, Italy on Saturday, Sept. 27th. While the affair was kept private, Peoplehas the exclusive photos of the lavish nuptials at the 7-star Aman Canal Grande Venice Hotel, including a stunning shot of the newlyweds in their gown and tux. Amal, who has Duchess Kate-worthy locks and a killer designer wardrobe, looked positively stunning in traditional French lace gown by Oscar de la Renta (um, JEALOUS). 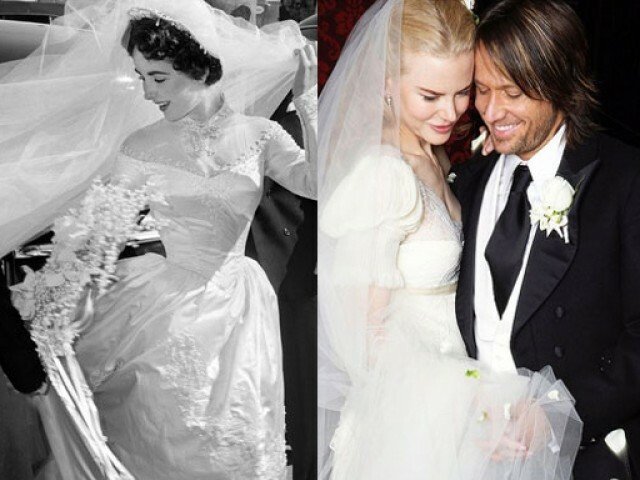 Featuring an off-the-shoulder neckline and a full train, the dress was topped off with a cathedral length lace-edged veil. The bride was glowing and beautiful, and the groom looked handsome as ever in an Armani tuxedo. Being married, Clooney told People, "feels pretty great". For more photos of the Clooney wedding, click through the gallery above.